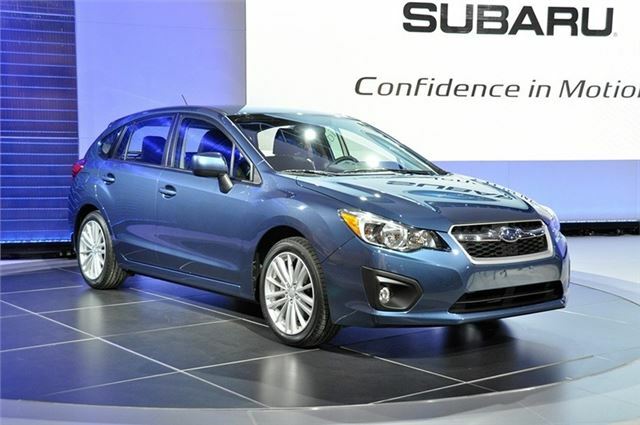 Subaru has shown its new Impreza, which features new engines and a more spacious interior, constructed from higher grade materials. It comes with four-wheel drive as standard and is set to go on sale in 2012. In the UK the Impreza will be offered with a new 1.6-litre boxer engine, coupled to either a five-speed manual or a Lineartronic CVT. The new engine should improve fuel economy over the outgoing model, though official figures are unavailable as yet. The new Impreza has a longer wheelbase than its predecessor, but with shorter overhangs. This means it takes up the same amount of road space as the outgoing model but offers improved internal space, with a more capacious interior and better visibility. The 2012 Impreza is designed to look bold, with emphasised wheel-arches betraying the cars 4x4 capability. The hexagon motif seen on the XV concept revealed recently is also seen on the new Impreza and is set to become a theme of Subaru design. 15-, 16- and 17-inch wheels are to be available. The door apertures are five-inches larger than those of the outgoing model, meaning entry and egress should be easier. The longer wheelbase and a redesigned interior with new seating means that the rear-seat passengers gain two-inches of legroom, as well as a larger boot. Folding rear seats increase the load space, and when a particularly bulky cargo is being carried the parcel shelf can be stored under the boot floor, much like the Forester. Along with all-wheel-drive, the Impreza will be available with various safety equipment including dynamic stability control, ABS, brake assist and electronic brake-force distribution. The current WRX STI Impreza will continue to be sold alongside the new Impreza unchanged.